This deformation modifier can be used to warp parts of a mesh to a new location in a very flexible way by using two objects to select the “from” and “to” regions, with options for using a curve falloff, texture and vertex group. The Warp Modifier is a bit tricky at first, but it helps to understand how it works. The modifier requires two points, specified by object origins. The “from” point designates a point in space that is pulled toward the “to” point. It is akin to using the Proportional Editing in Edit Mode. Specify the origin object transformation of the warp. Specify the destination object transformation of the warp. Enables volume preservation when rotating one of the transforms. 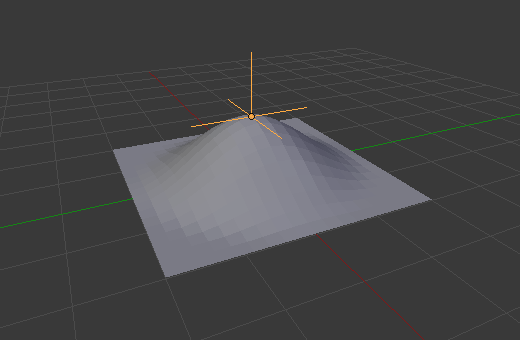 Limit the deformation to a specific vertex group. Sets how strong the effect is. Sets the distance from the transforms that can be warped by the transform handles. Sets the way the strength of the warp change as it goes from the center of the transform to the Radius value. See Proportional Editing for descriptions of the falloff types. 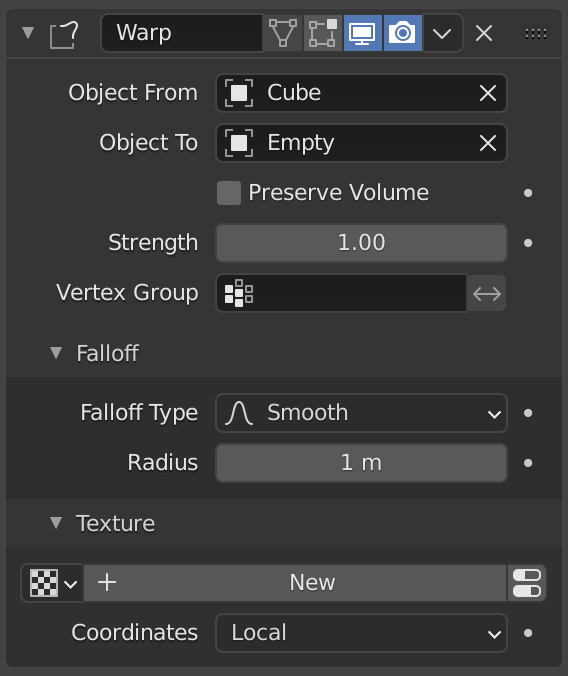 Specify a texture the strength is offset by to create variations in the displacement. Set the way textures are applied to the mesh when using a textured warp. Specify an object to use when set to Object. Specify a UV map when set to UV. The Warp Modifier can be awkward to use sometimes and the use case is rather small however, there are a couple of uses. For example, The Warp Modifier can be used to have an interactive Proportional Editing that can be used for animation. Another way to use the Warp Modifier is to use it similar to the Deform Modifier. This allows you to deform parts of the mesh without having to make a vertex group.